With just 16,895 miles (not a misprint) and featuring original paint, original interior, and an untouched chassis, this 1955 is a virtual time capsule. 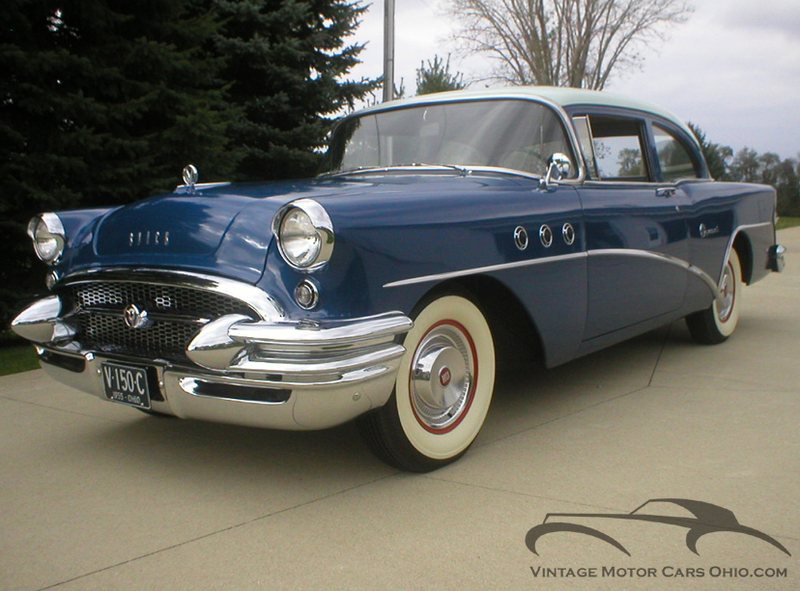 If there�s a better driving, smoother, tighter 1955 Buick anywhere, I�d be surprised. That�s factory-applied code EGG Temple Gray over Victoria Blue paint, and it�s amazing for 55 years old. Of course, blemishes happen over the course of 55 years, and this car has a few marks, most notably at the base of the rear window near the trunk opening where there are a few small chips. But again, they�re so minor that I would not consider a repaint to be the proper remedy. Further evidence of the car�s low mileage claims are the original gas station maintenance stickers on the driver�s door jamb. In 1961, it showed 9505 miles and by 1965 showed just 13,587 miles, so this car was never a daily driver. Two years ago, the engine bay was completely detailed for show. Hardened valve seats were added to the heads and the entire valvetrain was rebuilt. A fresh carburetor was installed, the generator and starter were rebuilt, the radiator restored, and the wiring harness was replaced with an exact reproduction. It has been driven less than 50 miles since, presents in 100% show-worthy condition, and drives like a brand-new Buick. The interior is also 100% original in every way. Overhead the headliner is intact, undamaged and taut, but is starting to discolor due to age�but like the paint, I would not even consider restoring it. The steering wheel is a very rare non-flexible piece that was discontinued early in 1955. The original AM radio works perfectly, and the heater and defroster are fully functional. The trunk still carries the original fabric lining, and what may very well be the original spare tire and jack assembly that has never been used. For more than 60 photos and more information, please visit our website at www.VintageMotorCarsOhio.com.